Realtor.com just released its hottest market list. Compiled from June data, Realtor.com studied listing searches in each U.S. market along with supply, demand and prices. The list revealed surprises. For the first time in six years, California markets did not rank in the top five. “California is not as hot as it was. It’s because of low inventory and median home prices in some areas that are close to a million dollars,” explains Realtor.com’s Chief Economist Danielle Hale. “We are seeing people looking elsewhere to less expensive areas,” Hale adds. The markets hitting three sweet spots—limited supply, strong demand and prices rising made the hottest market list. Days on Market (Realtor.com calls it Median Age of Inventory) is a key indicator determining a market’s health. 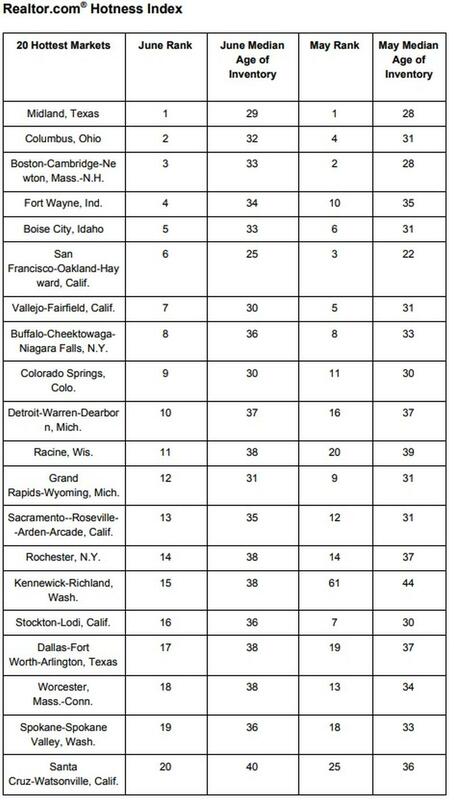 That number averaged only 34 days in Realtor.com’s top 20 markets nationwide. Here are the take-aways on the hottest markets. Eight of the top 20 were below June’s national median listing price of $299,000. It’s also clear Jeff Bezos’ reach goes far. Potential Amazon HQ2 cities including Columbus, Boston and Dallas all made the list. Columbus, Ohio, a possible HQ2 Amazon city, ranked second with 32 days on market. Its attractive median listing price of $250,000 is below the national median listing price of $299,000. Columbus is the state capital and has the largest population in Ohio, with 879,170 people. Columbus, home to Ohio State University, offers an array of art, theater, museums and other cultural options. A ranch style home with hardwood floors, sunroom, and nicely landscaped backyard is listed at $209,900. Fort Wayne, Indiana with 34 days on market has a median listing price of $197,711, an increase of over 11% from last June. “Fort Wayne is the lowest priced area on our list,” said Hale. Clearly, some of these markets aren’t on people’s radar. For those looking for a reasonably priced place to raise a family or even retire, several may be worth considering.